Repeated oval motifs emulate the picturesque look of cobbled stones in this wrap. Its style is so versatile: you could wear it with jeans and a long-sleeved tee or add it to a cute sweater dress for your next family get together. Bold clusters of bobbles bring texture and life to this living room staple. 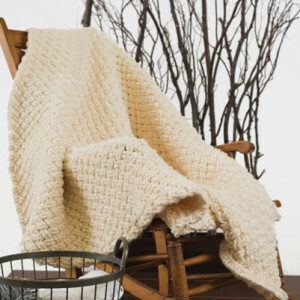 Its oversize pillow form and fluffy super bulky yarn is exactly what you will want to lay your head on after a long day. 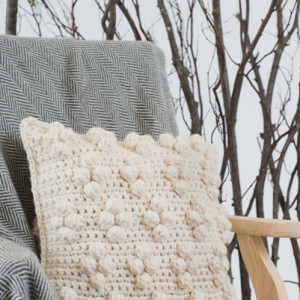 If you love curling up during an afternoon storm, then this afghan will be a luxurious addition to those relaxing moments. 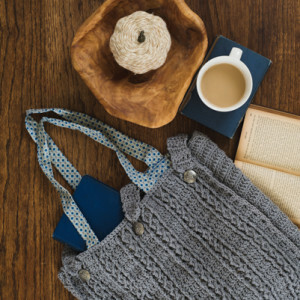 Its chunky yarn and cable stitches are definitely cocoon worthy.